After the Gala and the many after parties the evening before, it was delightful to have breakfast with Angostura Bitters at Manhattan Cocktail Classic. 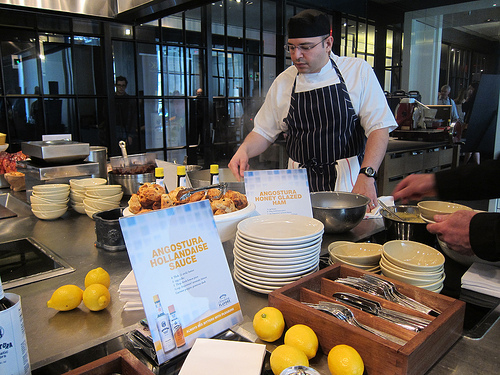 Angostura Bitters sponsored food throughout the day at the Industry Invitational at the Andaz 5th Avenue hotel. In the last few years, people have become accustomed to bitters as the “spicing” of cocktails. Considered essential like salt and pepper, bitters add a depth of flavor to cocktails. And from hanging out with bartenders, I discovered some liked bitters and soda or bitters and ginger beer/ale after a night of imbibing. Long used as a medicinal agent, bitters are believed to help settle people’s stomachs. But what about using bitters in cooking? 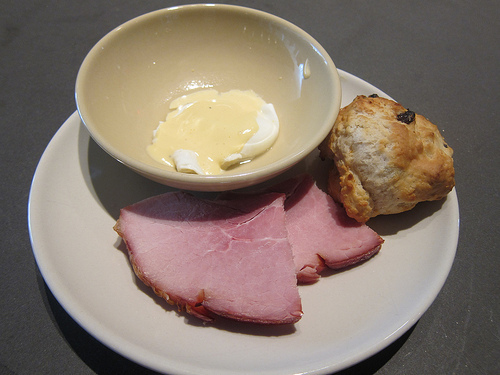 I was welcomed with eggs with Angostura Hollandaise sauce, Angostura-glazed ham and a scone. There was also Angostura-Chocolate sauce for fresh fruit (not shown). Rita Held, Angostura Bitters Culinary Brand Ambassador presented these recipes to the crowd. Melt butter in 1-cup measuring cup in microwave oven. Place egg yolks, lemon juice, Angostura bitters and cayenne pepper in blender container; blend on low speed 15 seconds. Continue running blender on low and slowly pour in butter. Continue to blend 30-45 seconds more. Makes 1 cup. Stir together honey, lemon juice and Angostura bitters. Score top of ham with sharp knife, place in small, shallow baking pan. Add a few tablespoons of water to just cover bottom of pan. Brush ham with glaze. Bake uncovered about 45 minutes, brushing with glaze often, until internal temperature is 145F. Serve sliced ham drizzled with remaining glaze. Makes 8 servings. If this seems like too much “cooking,” try splashing Angostura bitters on fish chowders and bisques or a splash or two on vanilla or coffee ice cream. This entry was posted in alcohol education, alcohol tasting, cocktail week, cocktails, history, spirits, the minty, travel and tagged andaz 5th avenue, angostura bitters, bitters, breakfast, cocktails, cooking, industry invitational, manhattan, manhattan cocktail classic, mcc, ny, nyc, recipes, travel. Bookmark the permalink.